Ladders and scaffolds are traditional tools that have been used for working at heights for decades. 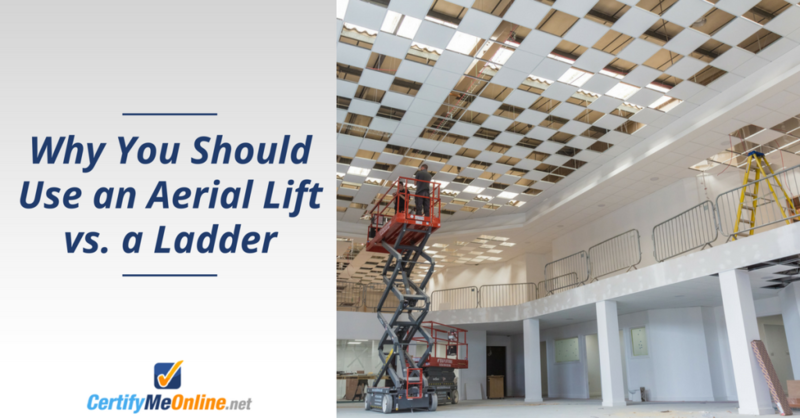 Modern advancements and increased industrial demands have pushed the envelope for what these tools can do safely, and have brought mechanical aerial lifts to the market. There are so many reasons to choose aerial lifts vs. ladders for a wide array of elevated jobs, with two of the main points being increased safety and capabilities. Aerial lifts are made from metal or reinforced fiberglass and feature a sturdy base that carries the weight of the extendable boom arm or platform with strength and durability. Workers do not depend on their own positioning skills to ensure the safety of an aerial lift, nor can their weight alone risk the stability of the lift. While it is important for aerial lift operators to keep in mind weight limitations, it’s even more imperative for work on ladders, which can buckle at the slightest weight overload. Industrial ladders can hold up to 300 pounds while many aerial lifts can hold as much as 1,000 pounds safely. Aerial lifts are made for withstanding the weight of workers as well as their equipment and tools. Workers on ladders need to constantly climb up, down, disassemble and reassemble when moving with progressing work. The constant movement can cause operator fatigue and increase the risk of falls and severe injuries. Aerial lifts vs. ladders can lower to nearly ground level for workers to step on the platform, raise and lower with the push of a button and can move around a worksite without requiring the operator to get in and out constantly. Even though ladders do not require fall protection equipment, falls are a very real hazard when working on them at heights, especially on ladders as tall as 40 feet. With aerial lifts, body harnesses and lanyards are required and are easily attached to access points on the lift platform to prevent workers from falling and significantly reduce the number of injuries and fatalities on worksites. When comparing aerial lifts vs. ladders, lifts are much more flexible when it comes to positioning for reaching heights. Aerial lifts can be placed directly underneath or in the most optimal position for accessing the work area and can be raised to the exact working height needed. Ladders are trickier. Using too short of a ladder can tempt workers to stand on the top rungs or overstretch to reach the work area. A ladder that is too tall may be set up against a wall and can slip out from underneath the worker. Even with these benefits of aerial lifts vs. ladders, workers need proper training and certification to operate them safely. CertifyMeOnline.net provides online OSHA-compliant aerial lift training to help workers stay safe, prevent accidents, and use equipment as efficiently as possible. This entry was posted in Aerial Lift Training on December 12, 2017 by admin.